The last time we looked at OmniOutliner Pro was four years ago and the version was 3.0.2. And though a long time has passed, the current version of OmniOutliner Pro is only 3.9. Yet in that time The Omni Group has been steadily keeping OmniOutliner current, and the culmination is a finely-tuned, mature product that builds on a solid foundation. If your outlining experience begins and ends with Microsoft Word, the variety of options offered by OmniOutliner may be a bit bewildering at first. It is as much an information management and presentation tool as an outlining program. Certainly, the classic indented multi-level outline is the foundational pattern upon which outline documents are based, but it’s where OmniOutliner goes from there that makes it so compelling. Version 3.0 brought us most of OmniOutliner’s marquee features like inline comments, file attachments, named sections, and robust export options. Extensive formatting options with user-specified styles bring can bring flair and enhance readability. Multiple columns with checkboxes and drop-down menus ease list management. The Omni Group has added an array of enhancements since version 3.0 to keep OmniOutliner at the top of its class. Take auto-save. Switched on and set to a five-minute interval by default, auto-save can backup currently open documents as frequently as every minute. Should the application crash, the backup copies will automatically load the next time it’s launched. 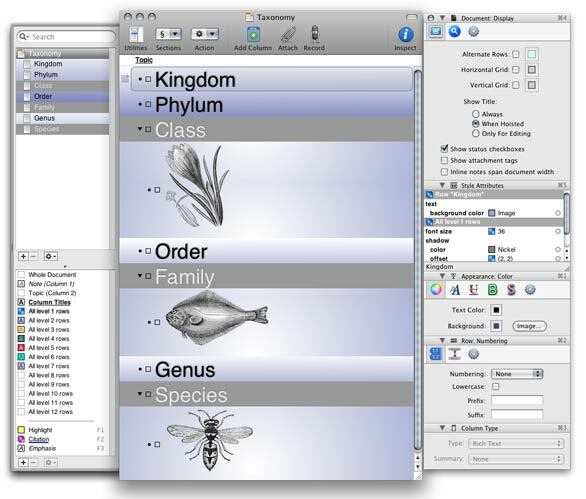 OmniOutliner now supports the Quick Look feature introduced in Mac OS 10.5. Select an OmniOutliner icon in the Finder and press the space bar to see a preview of its contents. Better still, select the icon of an attachment within an outline and hit the space bar for a preview of the attachment. OmniOutliner has also picked up the ability to export to Microsoft Word 2008’s docx format. Introduced to the Mac with Microsoft Office 2008, docx is an extensible markup language (XML)-based word processing document specification. OmniOutliner does an admirable job of rendering outlines for Word despite the significant differences between the two applications. Standouts among the other 12 export options are Dynamic HTML for Web pages that allow outline levels to be folded and unfolded; Apple Keynote for presentations; and Outline Processor Markup Language, an open standard for sharing outlines across applications and operating systems. OmniOutliner's extensive formatting capabilities can snap up the driest subject matter. The only disappointment about OmniOutliner Pro was the dated documentation. While the product has picked up some significant new features since the release of version 3.0, the documentation has languished. Learning about new features and limitations required hunting down the release notes page on Omni Group’s Web site. OmniOutliner Professional 3.9.1 is still the best outlining and list management tool on the market. Omni Group has wisely avoided gratuitous feature creep, focusing instead on keeping current with the Mac OS and judiciously enhancing a solid feature set.